Synopsis: Lara Jean and her love letters are back in this utterly irresistible sequel to TO ALL THE BOYS I'VE LOVED BEFORE. Lara Jean didn't expect to really fall for Peter. But suddenly they are together for real - and it's far more complicated than when they were pretending! Despite the best intentions of those around me, who eagerly dismissed it as chick-lit, PS. 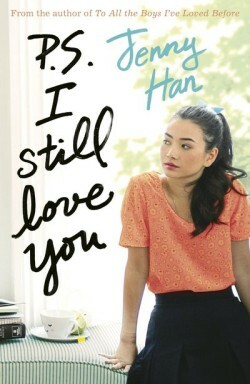 I Still Love You was one of my most anticipated reads of the year. Having read of the trials and tribulations of Lara Jean in To All The Boys I’ve Loved Before, I was eager to return to the lives of the Song-Coveys. There’s always a worry that a sequel will rehash its predecessor, but PS I Still Love You avoids this adeptly. If Lara Jean’s first story was about stepping into the role of mothering at home (their father is a widower; her older sister Margot recently moved to Scotland), then this novel is about standing up for yourself and growing up. It’s wonderful to see Lara Jean struggle and succeed with love, and friendship, and school, and the issues are never overcooked until ridiculousness. I’m not sure we’ll be seeing more of the Song-coveys any time soon; PS I Still Love You doesn’t end with the expectation of more to come. But whatever the outcome, The novel ends on a satisfying note. It’s rare to come across such a charmingly entertaining novel.